WTN- Egyptians sought to preserve the body after death, fearing that the wandering soul might be lost if it had no corpse to return to. 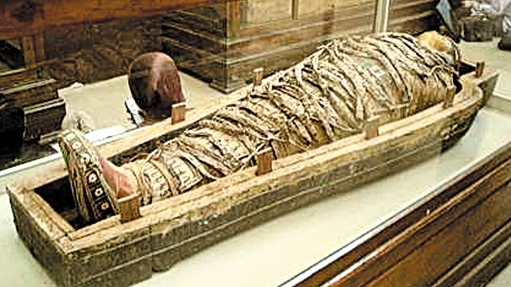 Mummification, preparing the body of the dead by removing perishable internal organs and embalming the remains, was a practice originally confined to royalty. Poor people buried their dead in the sand,which inhibited decay. In later times, however, many Egyptians were mummified and buried in coffins on which spells were inscribed to ward off evil and launch the spirit safely on its heavenly journey. “I shall sail rightly in my bark” reads one such verse. “I am lord of eternity in the crossing of the sky”. Mummified animals were buried as offerings to deities such as the cat goddess, Bastet.